I have found my absolute new FAVORITE overnight french toast recipe. This is it. Pumpkin. Cream Cheese. Streusel Topping. Caramel Syrup. Now that you have envisioned heaven, you definitely have to make it! All the prep work is done the night before and ready to pop in the oven the next morning. This is the perfect fall breakfast to wake up to. Each bite melts in your mouth and is the perfect blend of flavors. This recipe is my FAVORITE overnight french toast recipe to date! 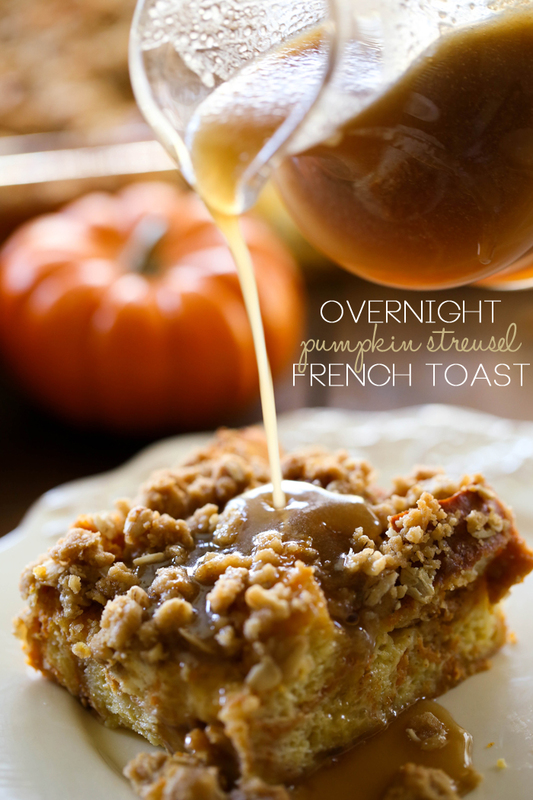 The streusel topping is amazing and the caramel syrup is the perfect compliment to the pumpkin flavor! Spray 9x13 inch baking dish. Cut french bread into 1 inch cubes. Spread half french bread in bottom of baking dish. Cut cream cheese into ½ inch cubes. Evenly spread cream cheese over top of bread cubes. Place remaining bread cubes over cream cheese layer. In medium mixing bowl, combine eggs, milk, pumpkin, sugar, vanilla, pumpkin spice. Pour evenly over bread. Cover with saran wrap and store in refrigerator overnight. In a small mixing bowl, mix the flour, oats, salt and brown sugar together. Cut the butter in with a pastry whisk or a fork. Store in ziploc in refrigerator overnight. Remove from refrigerator and sprinkle streusel topping over top. Bake at 350 degrees F for 45-55 minutes or until golden brown. Combine brown sugar, heavy cream and light corn syrup in a medium saucepan. Cook on medium heat for 4-5 minutes or until syrup is warmed through and sugar is dissolved. Drizzle over cooked french toast. I made Pumpkin French Toast today, too. But not overnight :) Although I did that, last year? or the year before. Lol. That's the easiest way, for.sure. And yours looks incredible. That streusel!!! And the CARAMEL syrup. girl. Pinned! Wow! This is definately the most amazing overnight french toast I have ever seen!!!!! I can't wait to put a bite of this in my mouth! Love your picture! WHOA. This looks to die for!! You had me at streusel!! I can't wait to try and make this recipe! I was thinking though....what do you think about using croissants instead of French bread? Do you think the consistency or taste would be off? Do you think I could prepare on thurs night & cook on sat morning?